This book presents the concepts and terminology of cognitive patterns and cognitive modeling. It thoroughly explains the uniqueness of cognitive patterns as an approach in modeling business systems and processes. Konitzer, et al. wrote:This book presents the concepts and terminology of cognitive patterns and cognitive modeling. It thoroughly explains the uniqueness of cognitive patterns as an approach in modeling business systems and processes. 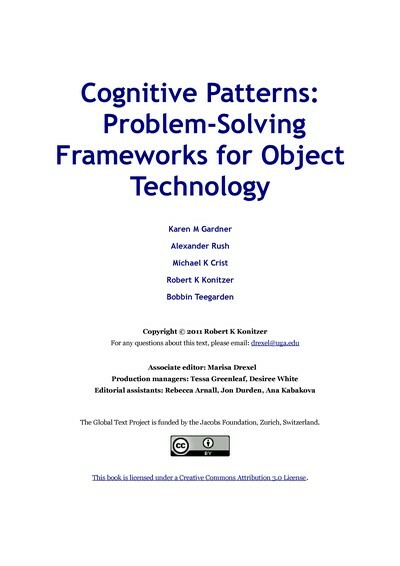 The authors introduce KADS Object (a nonproprietary set of cognitive patterns) as a special framework for enabling object-oriented (OO) analysis and design. The use of KADS Object in concert with any OO methodology leads to the creation of robust, understandable, and testable OO models and systems. The book is organized into three major sections. The first section introduces the concepts of cognitive modeling and KADS. The second section examines the specific mappings from the KADS Object model components to OO design elements. The final section discusses cognitive patterns for typical OO development life-cycle activities. This book will appeal to the OO practitioners who are interested in the modeling and development of large-scale and complex OO systems, those interested in modeling business processes as collaborating objects, and Information Technology (IT) professionals interested in knowledge management. Michael K Crist has worked in information technology since 1983. He has participated in all phases of object-oriented (OO) software development, including project management, testing and performance engineering, object modeling, and OO technical and application architecture design. He holds degrees in anthropology and biostatistics. Karen M Gardner, Ph.D., has worked in information technology since 1977 and with objects for over 10 years. She specializes in object-oriented analysis/design, distributed intelligent objects, cognitive modeling of business processes, knowledge analysis and project management. She has participated in all phases of the life cycle of object oriented projects. Robert Konitzer has worked in information technology since 1986, with a focus on the pragmatics of software development. He has worked extensively on the architecture and design of distributed client/server systems since 1989. He holds an MBA degree with an emphasis in MIS and Operations Research from the University of Denver (Colorado, USA). Alexander Rush has held a variety of positions in information technology since 1983, with an emphasis in knowledge analysis and object-oriented analysis and design. He has been a practitioner of KADS Object for the past six years, with experience in cognitive modeling applied to object-oriented analysis and design, knowledge engineering and management, and enterprise object modeling. Bobbin H. Teegarden served as the Chief Technology Officer of EFueler.com. She has been a business engineering consultant and IT (information technology) professional longer than she cares to admit. Her current specialization is in enterprise knowledge modeling of complex systems and business application architecture and design using object-oriented and Expert Systems techniques. Her professional background experience has spanned systems engineering to management consulting. She is currently working on applying complexity and chaos theories to business modeling and application architecture.